January 2015 Harvest, Rinsed and Squeezed. This page was updated on 3/21/2017. ​Biological Filtration comes from the substrate and Live Rock. 3/4 - 1 cup of Rox .8 Carbon changed out weekly in a BulkReefSupply Reactor. Filter Floss is also in the reactor to keep the carbon from shifting and does trap some particulate removal instead of clogging up the carbon. The main filtration though is a waterfall style Algae Turf Scrubber for over 5 years. 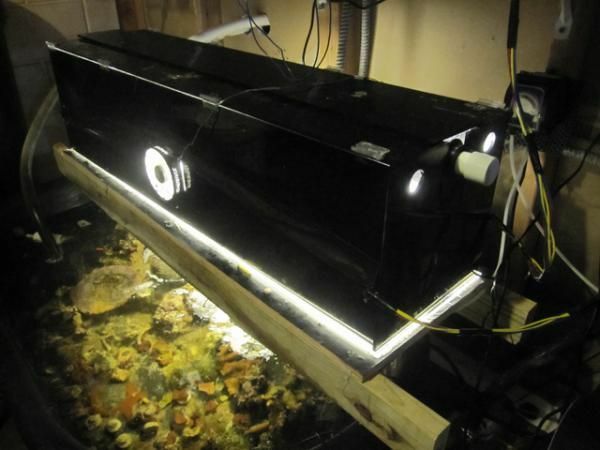 Prior to running the ATS, I used to run a BubbleKing 3000external skimmer. 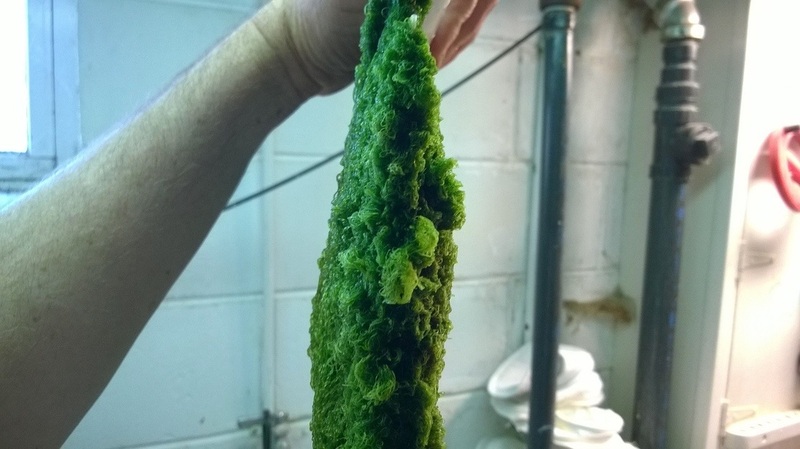 Algae Scrubber keeps nitrate levels non-detectable. Phosphates will typically hover in the .06.-08ppm range. To get phosphates to non-detectable levels, I dose KN03 solution nightly. Additional details for KN03 dosing can be found on the additives page. My first ATS was has a great success and running since Jan 2012. 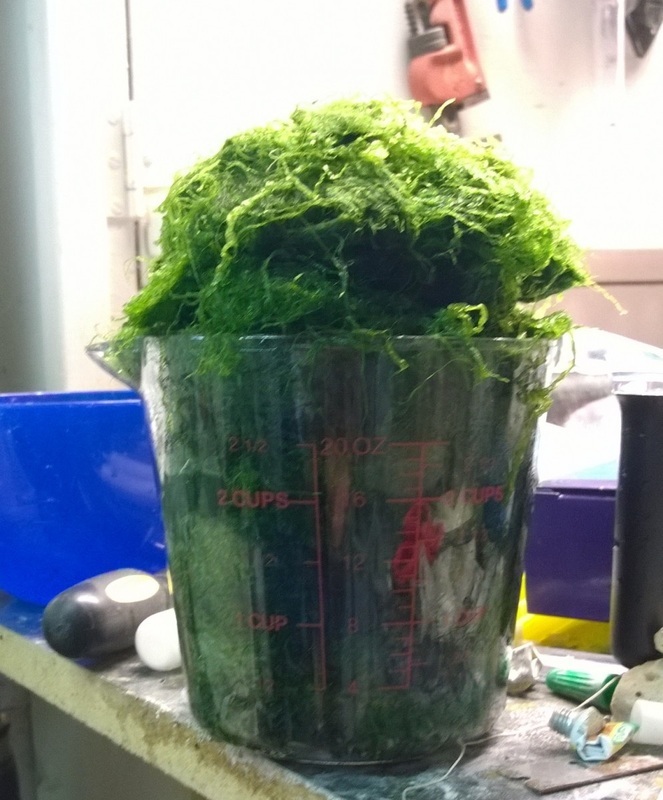 It has been pulling out almost a quart of algae each week. Show tank has looked awesome the entire time and never skipped a beat. In August 2012, I created a new ATS version which sits next to the sump. No drain lines or bubbles. The water level flows to the sump by reaching equilbrium. I eliminated the feed pump. Directly Feed from Herbie Overflow. There is a emergency drain in the overflow for redundancy. In 2015, I changed the lighting from T5s to LEDs using the chineese dimmable 300w growlights. The sweet spot is 40% ( 40W each side ) intensity for my system. I didn't get any better or faster growth increasing the light intensity.. Overall size is 24" Long, 14" tall, 8" wide ( screen area compartment is 4" wide and 2" on each side for lighting ). It's taller than first one because I want the bottom 2" to be submerged to reduce noise and salt spray. Parts of it is red acylic. The rest just used red duct tape ( just for fun ). May cover it entire with red to help block light but want to leave a bit open so I can observe. It's located in a fish room so I'm not worried about light spillage. Input and flow: Gravity drain directly from the show tank. The overflow uses the herbie method so the input is be bubble free. The flow is estimated around 600gph. Screen size is aprox. 18" Long X 8" Tall. According to the sizing rules that is about 10-12cube per day feeding capacity. Which is about what I have been feeding even with the much larger ATS. Lighting: 2 Chinese 300w Dimmable Grow lights. Light Cycle: 16 hours on 8 hours off. Most of the acrylic I already had or was from the scrap bin. I did have to purchase the 2 bigger pieces was was $40. 2 LED fixtures are $100 each. I'm sure some misc. pvc etc. but was negligable amounts. ​Same Enclosure just changed lighting from T5s to Dimmable LED Units, Run them at 40% which is 40w on each side.